This is an attempt to answer the most frequently asked questions we receive here at Film Score Monthly. I hope the below responses are useful and invite readers to send in suggested topics for inclusion in a later incarnation of this FAQ. Thanks everyone! 1. Q: How can I become a film composer? 2. Q: Where can I find a CD of music to a particular film? 3. Q: Where can I find the written music to a soundtrack? 4. Q: What was the music I heard in a trailer to an upcoming film? 5. Q: How can I contact my favorite film composer? 6. Q: When will you reissue (for example) The Poseidon Adventure? 7. Q: What’s with the no-bootlegs thing? 8. Q: What are those numbers like 1M1, 1M2 in some articles and liner notes? 9. Q: How do you decide upon the cover art for your CDs? 10. Q: Are there two versions of FSM's CD of The Taking of Pelham One Two Three? And why? 11. Q: Do you have any jobs, internships or writing opportunities available? 12. Q: Will you guys issue a CD of [name any unreleased score]? A: This question gets asked so often, and the answer is so lengthy (though not necessarily helpful—sorry) that we have posted it separately here. A: Check two places: Our retail partner, www.screenarchives.com, who have an outstanding collection of new and used CDs; and, for reference information, www.soundtrackcollector.com, an unparalleled database of LP and CD catalog numbers, track lists, cover images and more. If you find no listings, you could be out of luck—it simply could not be available on a CD. This is sadly often the case. And if it's not available, there’s nothing you can do to get it, sorry to say. A: The sad reality is that virtually no film music is available like this. You can get piano reductions from places like www.halleonard.com (particularly of popular John Williams themes) but not the complete scores and not the actual film orchestrations. The reason for this is because publishing music in book form is very expensive; film music carries a lot of costs due to the composer and publisher rights involved; and companies are afraid they could not control public performances were their music to be made widely available. It is often possible to make appointments at specialized libraries with film music collections, but you have to view the material in person and photocopying is seldom allowed. For example, Alex North’s and Jerry Goldsmith’s sketches are at the Academy of Motion Pictures Arts and Sciences (in Los Angeles); Elmer Bernstein, Dimitri Tiomkin, George Duning donated their personal scores to USC (LA again); Max Steiner and Jerry Fielding’s papers are at Brigham Young University (Provo, UT); and so forth. Do a google search for the composer you are interested in and perhaps add “papers” or “collection” and you can often find out where their materials are housed and get a contact number or email address. Also, the historical M-G-M and Warner Bros. studio music libraries were donated to USC while the CBS archives ended up at UCLA. We often review this material while producing our FSM CDs. If you represent a performing orchestra and want to rent film music for public performance, a great variety is available from Themes and Variations (www.tnv.net). Themes and Variations does NOT rent or sell music to collectors or fans, however—only performing orchestras. UPDATE 12/3/09: In recent years the full conductor scores to have become available to many films. Check out the John Williams Signature series from Hal Leonard. There are also less expensive editions by Belwin and Hal Leonard of various composers (Lord of the Rings, Harry Potter). Check out www.sheetmusicplus.com and http://www.truespec.com/-c-125_104.html. Thanks to Peter Roos for this update. A: Motion picture trailers today are almost always produced independent of the films they are advertising. Certain pieces of music have become popular amongst these trailer production companies for their ability to “sell” a movie and convey a lot of emotion in a short period of time—hence they are frequently used in trailers to unrelated pictures. Film scores like Come See the Paradise, Dragon: The Bruce Lee Story, Rudy and Hoffa—and classical pieces like the ubiquitous “O Fortuna!” from Carmina Burana—are several notable examples of pieces of music which have been taken out of their original context and used over and over for different marketing campaigns. We often get requests from listeners captivated by the music they heard in a trailer and dying to identify it. Because it’s very hard to describe music in an email, this is a challenge. It is made even more complex by the fact that TV commercials can be different from theatrical trailers and each can have several different pieces of music—or new variations or “knock-offs” of same—or original music altogether. We recommend that listeners consult an excellent index of trailer music at this URL: http://www.soundtrack.net/trailers. The site also has helpful lists of composers of studio logo music and isolated score tracks on DVDs. A: Write him or her through an agent. Agencies’ client lists and addresses change so often that we’d run the risk of printing outdated information here if we listed any of them here; please see the excellent database at http://www.soundtrack.net/representation. A: Go here for an in-depth explanation on why some of our titles have gone out-of-print and won’t be coming back. 7. Q: What’s with the no-bootlegs policy? A: We have few rules on our message board but one of them is that we forbid discussion of pirate, unauthorized or “bootleg” CDs. It was a policy decision we made a long time ago for several reasons. For one, we’re ethical fellows. Stealing is wrong. For another, more practical reason, pirate CDs are typically of poor quality and only damage the ability of legitimate labels to put out official, superior versions. Now that we’re one of the labels, especially, it is maddening to compete against crooks peddling stolen goods. Remember, just because someone has snuck the masters out of the studio somewhere doesn’t mean the pirated CD is put together properly, or sounds good. In our experience, the studio paperwork is often as important as the music in order to use the correct takes, sequence everything properly, etc. If we were to allow discussions of bootlegs, even though a lot of that discussion might be in our favor, it would only attract people to the illegal products. So we have a complete blackout on them instead. A: Those are production “slate” numbers. 1M1 is the first piece of music heard in reel one of the movie, for example (usually a reel is 10 min long, so a two-hour movie has 12 reels), 1M2 is the 2nd piece in reel one, etc. (The character name "R2D2" from Star Wars, by the way, was famously inspired by George Lucas liking the sound of it when someone called for "reel 2, dialogue 2" during the making of an earlier film.) We include these from time to time for historical purposes and also to help people understand what they are listening to when the music is presented out of sequence on the CD. A: FSM art director Joe Sikoryak responds: "There are many factors that determine selection of cover art, including contractual restrictions (sometimes we must reproduce LP covers exactly), familiarity (some key art is inseparable from a film's marketing) or aesthetics (like many collectors, we have a fondness for paintings over photography). But there are just as many reasons to create new artwork for our covers, including unavailability (some older, obscure titles don't have extant artwork); attractiveness (sometimes original posters are downright ugly); or suitability (the studios routinely reconfigure artwork to fit different formats, but some 27" x 41" posters just don't shrink to fit a 5" x 5" CD cover). But in the spirit of our audio presentations, we try to present artwork that represents the film, in a style suggestive of the period it was released." 10. Q: Are there two versions of FSM’s CD of The Taking of Pelham One Two Three? And why? Yes, and here’s the story. The Taking of Pelham One Two Three was the first CD released by Lukas Kendall—produced at the end of his senior year of college (spring 1996). It came about as a lark and there were no plans to start a record label at the time; FSM the print magazine was doing an article on the score (it is one of our favorites) and it turned out that composer David Shire had the only surviving masters. We (well, I—this is Lukas writing this) asked MGM for a license to do a limited CD (sold via mail order only—we used Screen Archives Entertainment, as we do today) to tie-in with the article and were kindly granted one; to get a reduced royalty rate I explained the “archival” nature of the project and said the CD would be labeled “for promotional use” only, though it was fully authorized to be sold. (My memory is a little fuzzy and I’m not proud, so sorry.) This first CD release (Retrograde FSM-DS-123; I chose the name “Retrograde” because it is one of the permutations of a musical “12-tone row” as used in the score) had 20 tracks running 32:54 (the complete score) and homemade art direction by myself. The cover is the film’s one-sheet. There were at least 1,000 copies but memory fails me as to how many we made. Some years later the first edition was completely sold out but with our license still active (and since renewed with an extension)—and with at least one bootleg LP appearing (see below)—we decided to repress the title. David Shire wanted to tighten the album master for listening purposes and did so with his engineer in New York; he added stereo reverb and combined cues (making some brief cuts) so that the second version is 11 tracks, running 30:55. The package design was redone by our longtime art director, Joe Sikoryak. The cover of the reissue is the one you will see on our website with Robert Shaw pulling the gun on the train conductor (which was the back of the booklet on the first edition). The liner notes are more or less the same in both versions. The 2002 “second edition” was renumbered Retrograde FSM-80123-2 (per our barcodes) and is the only version of the CD we carry today though the first one occasionally comes up as a used title; we defer to David Shire’s judgment as to the album presentation and have no plans to re-release the earlier master. We had no involvement in the LP(s) that have appeared of the score. They are all pirated from our release(s). The remixes and interpretations on youtube, et al. we have found highly enjoyable. We’re thrilled to have gotten this fantastic score out there for all to enjoy. A: It depends. We do not have job openings as in, “I work at Film Score Monthly and that’s how I support myself.” Sorry. Nor do we have paid or even unpaid internships as in, “I interned at FSM last summer”—because we don’t even have a office. We used to, but not anymore. The FSM “office” is a one-person room in Hollywood with barely enough room for Lukas Kendall to turn around. Everybody else works from home—some of us from different states. Welcome to the modern world. We do, however, have opportunities available—provided you don’t care about making money and just really love film music. In fact, almost everyone who is a part of our merry little band started out as a volunteer contributor who wanted to offer his or her (mostly “his”) services in writing, art direction, website programming, proofreading et al. Over time, some of us have managed to make a (part-time) living off of it. It’s like they say: you gotta pay your dues…review a bunch of lame CDs, and soon you can review the “hot” CDs, do the big-name interviews, write liner notes, etc. If you want to give it a whirl, here are the options. FSM Online is always looking for volunteer contributors. They rarely if ever compensate monetarily but offer CDs and subscriptions. 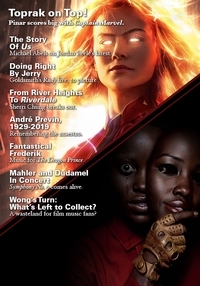 FSM Online is run by Jon Kaplan and Tim Curran and if you want to join their team, email support@filmscoremonthly.com and let them know what experience you have (if any) and what you might be interested in doing; send a writing sample if you have it. Their needs are always changing but they will let you know. If you are interested in building a résumé and putting your interest in film music to productive use—and heck, just to be published and find out what it’s like to get feedback—this is a great opportunity. If you want to write liner notes for us—write for FSM Online first. The liner notes are a higher pressure gig and we do almost everything in-house nowadays. But we do recruit from FSMO when we find someone with a good attitude, superior ability and project-specific knowledge. Thanks for your interest and in all seriousness: people who have by now done art-direction and liner notes for dozens if not hundreds of our CDs started out by emailing and saying, can I help with anything? We said sure, and the rest is history. Don’t be shy but at the same time please understand if the timing and needs aren’t right at any given moment. Thank you. A: Maybe—maybe not. Please read this carefully and if I referred you to this answer via an email, you must not take it personally! We release the CDs that we can in the order that we can. If there's a score that people want, if we can get the rights and access to the best-available master tapes, we'll do it. If not, we won't, or we'll postpone it until the time is right. Certain studios work with us, certain studios work with other labels, sometimes there are collaborations between companies and labels, sometimes not...you can figure it out if you look at our releases and check the studios (at imdb) or original LP labels involved, but I don't want to outline them here as things change all the time. With the master tapes, some scores have survived in great shape, while some scores are jigsaw puzzles to put back together, and others are lost entirely (or so we think, until they turn up under a rock...though they typically don't). If you email me asking us to release a score (or a more common phrasing, WHEN are you going to release such-and-such a score) chances are I will give you a vague and useless answer. This is due to self-protection. I have nothing to gain by being specific. We do not announce our CDs ahead of time because we do not want people asking us if they are ready yet (which is like the infernal kids' question, "Are we there yet?") and we need the discretion to release the CDs when they are good and ready—not rushed. Sometimes people will see an anniversary or a film or composer coming up and wonder if a CD is in the works...I long ago decided these projects are hard enough without trying to hit some artificial deadline. So let's say you email me asking about your favorite score—back to why I gave you a vague and boring answer: If we are working on it, I certainly won't tell you, because I don't know when it will be out and don't want you to write every six weeks asking if it's ready yet. If I know a competitor is working on it, I will not tell you out of respect to the competitor. If I am trying to work on it, I won't tell you because the last thing I need is information getting out that I am trying to work on it—I take people at their word when they say they won't circulate information, but how do I know that in six seconds the gist of my email won't end up on the message board, to be seen by one of the negotiating parties or a competitor? What I should be doing is working on the project, not explaining it to you, as enlightening as that might be. All of this is to ask you to please take the hint and not follow up (as in, "Who else can I write to get it released? "—I am not going to give out those kinds of contact addresses). I know what it's like to work up a head of steam only to hit a brick wall...so I hate to be that brick wall myself, but you have to trust that we have many great plans in the works. Finally, there is one topic I am completely retired from discussing. Those are the James Bond scores: people may know I produced the expanded masters to some of the 007 scores in 2003. It was one of the best gigs of my life but even by the time the CDs came out, my contacts at EMI (limited as they were) had left the company. So I truly, honestly have nothing further to do with the James Bond scores; I have no idea if anyone is going to do anything else with them; I don't know what other scoring masters might exist to do expanded editions (I know they have the multitrack masters to The Man With the Golden Gun but don't know about other titles). If it was up to me they'd all be out and complete, but it's not. Sorry, old chap.